Known in Mexico as La Gran Curva or La Gran Comba del Rio Bravo, Big Bend country is like nowhere else. 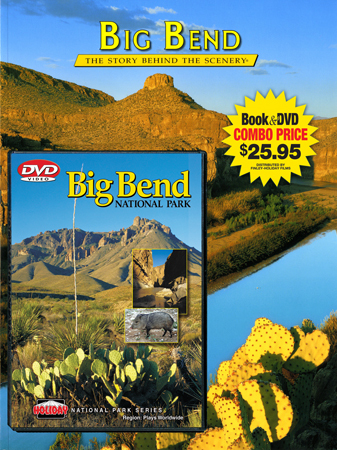 Lightly visited and remote, Big Bend National Park is one of the least known in the park system. Encompassing a huge sweep of the northern Chihuahuan Desert, at first glance the land seems lonely and inhospitable. Soils are barren and shade is scarce. It's surprising to learn that American Indians hunted here 10,000 years ago and that families of our grandparents' generation came to love the Big Bend as home. Come discover the remote beauty of Big Bend’s rugged mountains, river-carved canyons and vast desert wilderness. From arroyos of the Chihuahuan Desert, to panoramic overlooks of the Chisos Mountains, its all here. The variety of landscapes to be explored is incredible. In the heart of the Chisos Mountains you’ll visit the Basin, spectacular Lost Mine trail and South Rim Overlook. Hike a nature trail and investigate ruins near Hot Springs and Castolon. Discover the diversity of wildlife and plant communities here, including flourishing mountain and desert environments. See javelina, whitetail deer, great-horned owl, road runner and rattlesnake.